Sandstone Valley is a suburban neighbourhood in northwest Calgary, Alberta, Canada. Located northwest of the community of Beddington Heights, this primarily low-density residential community is bounded by Country Hills Boulevard to the north, Beddington Trail to the east, Berkshire Boulevard to the south and 14th Street W to the west. The Nose Hill Park is located south-west from the community. It is represented in the Calgary City Council by the Ward 4 councillor. Development of this community began in 1982, and was recently completed. 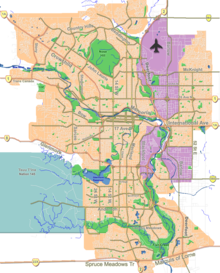 In the City of Calgary's 2012 municipal census, Sandstone Valley had a population of 6,253 living in 2,120 dwellings, a 1.8% increase from its 2011 population of 6,142. With a land area of 1.8 km2 (0.69 sq mi), it had a population density of 3,473.93,470/km2 (8,997.39,000/sq mi) in 2012. Residents in this community had a median household income of $75,002 in 2000, and there were 13% low income residents living in the neighbourhood. As of 2000, 36.2% of the residents were immigrants. A proportion of 1% of the buildings were condominiums or apartments, and 8.6% of the housing was used for renting. ^ "Calgary Elections". City of Calgary. 2017. Retrieved November 12, 2017. ^ a b City of Calgary (2006). "Sandstone Valley Community Statistics" (PDF). Archived from the original (PDF) on 2008-04-11. Retrieved 2007-05-09. ^ a b "2012 Civic Census Results" (PDF). City of Calgary. 2012. Retrieved February 4, 2013. ^ "Community Boundaries" (Esri shapefile). City of Calgary. Retrieved February 5, 2013. ^ City of Calgary (2004). "Ward 4 Profile" (PDF). Archived from the original (PDF) on 2008-04-11. Retrieved 2007-05-09.